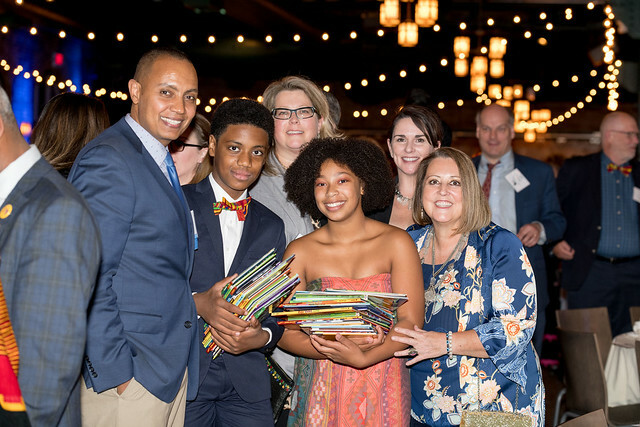 Books For Africa held its 30th Anniversary Gala on Friday, September 28th, in Minneapolis, Minnesota. The celebration, attended by 500 BFA supporters and VIPs from around the world, was the highlight of a busy and successful day of events! A business luncheon at the University Club of Saint Paul kicked off the day, where an exciting new collaboration between BFA and the African Union was announced by H.E. Arikana Chihombori-Quao, African Union Ambassador to the U.S. The first container of books delivered through this ongoing partnership will arrive in time for a ceremony at the AU headquarters in Addis Ababa, Ethiopia during the annual AU Summit! Read the full announcement in the African Union press release. BFA tablets pre-loaded with the Merck Medical Manual app were also distributed to members of the African diplomatic corps in attendance through an ongoing partnership with Merck & Co.
Next was a panel discussion hosted by MINN (Minnesota International NGO Network) at the University of Minnesota Humphrey School of Public Affairs, featuring Ambassador Chihombori-Quao, H.E. Carlos Dos Santos, Ambassador of Mozambique to the U.S., Jote Taddese, President of the BFA Board of Directors, and Patrick Plonski, BFA’s Executive Director. The discussion provided a unique opportunity for Minnesota NGOs to hear directly from key members Ambassador Chihombori-Quao and Mr. Taddese also teamed up to write this editorial on African development for local news outlet Minnpost. Prior to the evening Gala, a VIP reception was held at A-Mill Artist Lofts in downtown Minneapolis. Guests at the VIP reception were treated to a presentation featuring remarks from African diplomats, and Minneapolis Mayor Jacob Frey. This gathering was highlighted by an announcement from Paul Thompson, Executive Director of BetterWorld Trust, that BWT is committing up to $70,000 to send five containers of books to countries across Africa! The Gala itself, held at the Nicollet Island Pavilion in Minneapolis, was an event to remember. The fabulous evening was capped off by an inspiring keynote address by the African Union Ambassador, who was our keynote speaker for the evening. In an emotional moment, we were honored to play a video message from the late Kofi Annan, who recorded words of encouragement at a BFA event he attended in May, just before his untimely passing. Mr. Annan has been a longtime supporter of BFA, co-chairing our Law & Democracy Initiative with Vice President Walter Mondale since its inception 10 years ago. The fundraising efforts at the Gala were a resounding success, with over $345,000 raised to send more high quality books to Africa. We also met with existing partners and new friends, strengthening relationships building a network of colleagues to aid in our efforts as we move forward. Books For Africa thanks all the sponsors, speakers, donors, and friends who made this event such a great success. 41 million books to all 55 African countries is a great accomplishment over 30 year, but as our Founder Tom Warth says, with over half a billion children on the African continent, there is much work yet to be done. As we celebrate how far we have come in our mission, we are even more enthusiastic about what can be accomplished over the next 30 years.